Fit your Food Processor with the Dough Blade or your Standing Mixer with the Dough Hook. Combine the Flour, Yeast, Dry Milk and Salt in your Food Processor or Mixer. Run, just to mix the ingredients together. Add the Butter and run to mix. You should have a soft Dough – if the Dough is too dry, add more Water, a Tablespoon or two at a time. If the Dough is too wet, add more Flour; be careful while adding Flour – you want to have a soft dough, not too wet and not too dry. Once the Dough has formed and is of the right consistency, let the Processor run for 1 minute and/or the Mixer for 6-7 minutes. Transfer the Dough to a greased bowl, cover with plastic wrap and allow to raise up at room temperature until doubled in bulk. This will take about 2 hours. When the Dough has risen, punch it down and press out the Carbon Dioxide that has formed. Shape into rolls or bread and place on a greased baking sheet and allow to rise again until doubled in bulk. 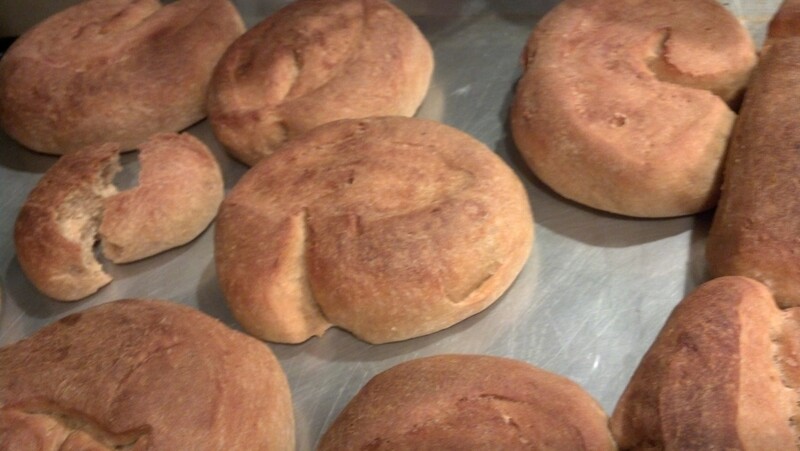 Bake in a 375 degree oven until the rolls or bread is a dark golden brown. (Internal temperature should be about 204 degrees) Or the bread if tapped on the bottom should sound hollow. Allow to cool in the pan for about 15 minutes and then remove to a cooling rack. To loosen the bread for a loaf pan, run a straight-edged spatula around the sides before turning it over. Note: If making the bread by hand, combine the yeast with ½ cup warm water and the Sugar or Honey that goes into the Dough. This will give you a faster and better rise.